Former first-round pick Vernon Hargreaves is seemingly facing a prove-it year in Tampa Bay after the Buccaneers selected multiple cornerbacks in the 2018 NFL Draft. Tampa essentially has drafted a contingency plan if Hargreaves continues to struggle to live up to his first-round billing. Through the first two seasons of his career, it’s been an underwhelming start but there are reasons to believe that under the right circumstances, Hargreaves can ascend in 2018. Hargreaves struggled through his rookie campaign as he recorded 14 missed tackles and allowed more passing yards in his coverage (1,065) than any other defender in the league in 2016. His overall grade of 44.4 ranked 94th out of 120 qualifying cornerbacks that year as far too often. 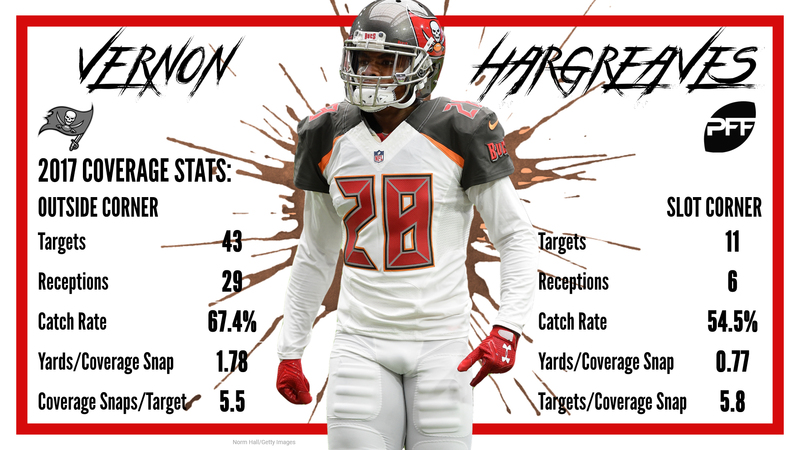 These problems continued into 2017 and through the first six weeks of the season, Hargreaves allowed 76.3 percent of all targets to be caught in his coverage and his overall grade had him ranked 111th out of 112 cornerbacks. His struggles came to head at Arizona in Week 6 as he recorded three missed tackles and allowed all five targets to be caught for 76 yards. His game grade of 33.5 became the second-lowest of his career. After facing the Cardinals, however, Bucs defensive coordinator Mike Smith made a change in personnel, shifting Hargreaves to the slot. As the team’s nickelback, Hargreaves began lining up much closer to the line of scrimmage and over the coming weeks he would have more opportunities to man up against his wide receivers across from him, often utilizing a press coverage look at the snap. The subsequent result in the game against Buffalo in Week 7 was promising. It still is the best game of Hargreaves’ career in terms of game grade as he did not allow a single reception on four targets. Over the next month, Hargreaves lined up as a slot cornerback on 57 percent of his defensive snaps and during this time, Hargreaves allowed just 0.41 yards per snap in coverage (eighth-best among cornerbacks) and held opposing receivers to a catch rate below 37.5 percent. Between Weeks 7-10, Hargreaves earned the second-highest overall grade among all cornerbacks (just behind Baltimore’s Jimmy Smith and just ahead of the Saints’ Marshon Lattimore). 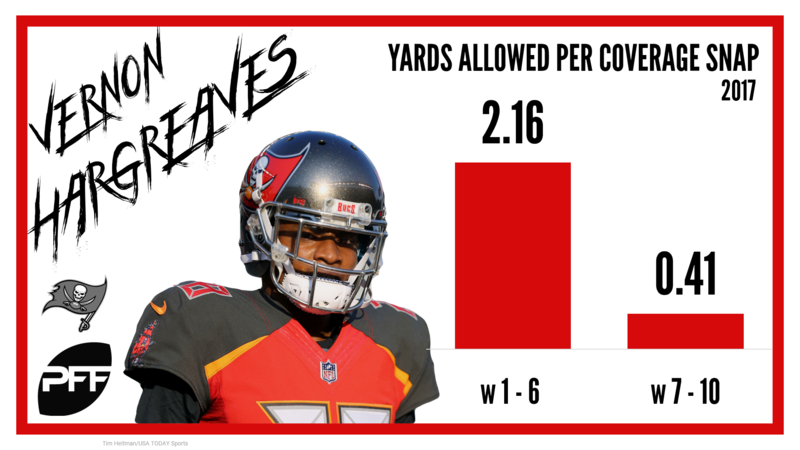 Although the Bucs would lose Hargreaves for the remainder of the season after a Week 10 hamstring injury sustained against the Jets, Hargreaves showed enough good in his limited time during those weeks, they intend to keep him in a similar role this season. Based on last year’s results, if this is indeed a prove-it year for the former Florida Gator, his prowess in the slot is more than good enough to prove he belongs in the starting lineup in Tampa.